How do your team members see each other? 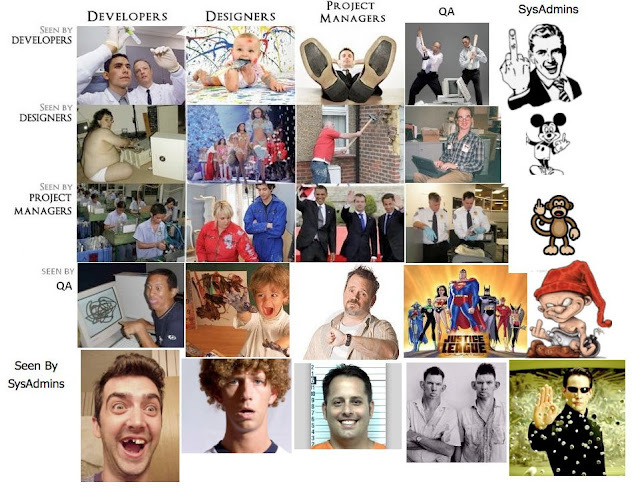 Recently http://quantmleap.com posted a funny photo about how our project team members see each other (note this is for a software development project). Have you ever attended a meeting or discussion that someone gives a presentation, uses a cool tool or ice breaker and you think to yourself, “I’m going to use this someday too!” Then months go by and that thought leaves your head, or that extra handout or copy of the presentation you took somehow found its way to the trash can. Early in my career I started a project management binder with copies of articles, presentations and so on, that I may want pull out later (like an ice breaker game). Recently I moved away from the paper binder to using box.com (in the cloud) to house my PM knowledge. First I just used it to store my resume online and I installed the box.com Linkedin app on my Linked in profile (now others had easy access to a Word copy of my resume). Now as I find those interesting PDFs or presentations I can toss them into my box.com site. Box.com offers 5 gigs of storage for free, and it allows file sharing links and access to your files via their mobile app. If you upgrade to a business account you can then use it with your project team members as a common location for project files. Technology changes so fast and we must keep up with the latest trends and monitor them to see if they are a good fit for our organizations. 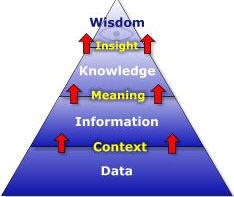 The same goes for the knowledge you gain as a PM, you need a place to store it or it will be forgotten. Here is a great example … A Norwegian company has built a USB thumb drive sized computer that has a dual core processor, runs Android, a slot for a memory card, Wifi, Bluetooth and you can connect it to any computer or TV (if TV then you need a Bluetooth keyboard and mouse). A pretty amazing piece of technology! So where will you store your PM knowledge? For the on the go PM they need a box full of tools. From laptops, to smart phones to various software packages to help manage the project and even for communication. There is a growing trend for PMs that travel a lot to use Skype to call into meetings. As long as you have a decent internet connection it works great, so no more dropped cell phone calls as you are sitting in your Vegas hotel room. Most laptops have a built in microphone, but a headset with a built in microphone seems to be the best thing to use. 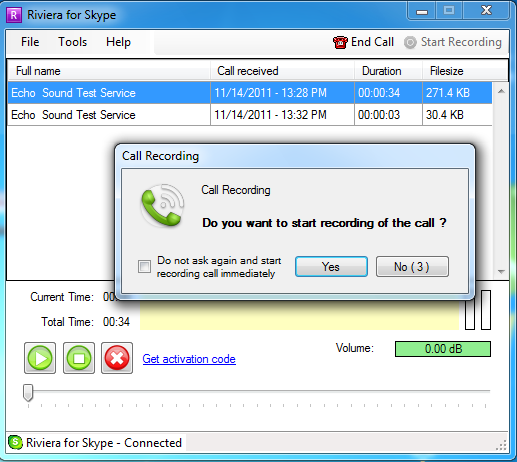 If for some reason you would like to record a call there is a product out there made by Jiteco titled Riviera for Skype, which offers a free 14 day full use trial, or $9.99 for the full product. Why might you want this? Maybe you are listening in on a meeting and you need to take a call on your cell phone (or run off to the bathroom). Or maybe you want to record the meeting and upload the MP3 to your project page to allow members to listen to the meeting at a later date. Or use it for creating interview podcasts! It is super easy to download and install. After it is installed launch the program and Skype will prompt you to authorize it to connect. 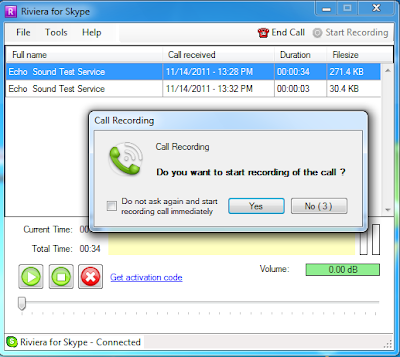 Then when you send or receive a call it asks you if you want to record the call. 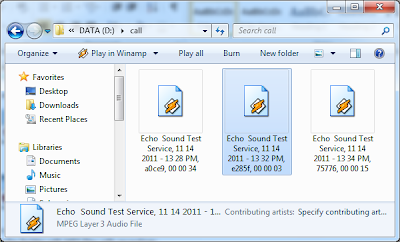 After you are done your MP3s are ready to listen to or move them to your project site or webpage. This is a super tool to have in your PM tool box and at only 10 bucks it is a super deal! Recently I had a chance to check out the full version of the PMP Practice Test that UCertify offers. It was very easy to install and easy to just jump right in and start using it. Overall if you all looking for +800 PMP exam questions that is setup like taking the actual test, then this might be for you. If you want lots of learning material you may be better off buying a book and make yourself read the PMBOK. I have a Zombie in my Project!?! It is the season for Zombies and unfortunately they make their ways into our projects. 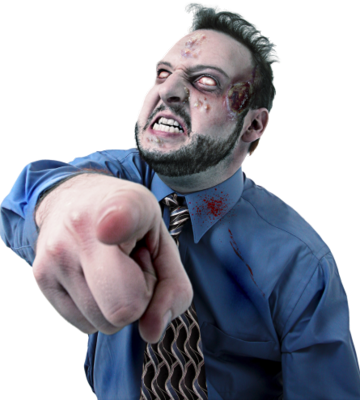 Zombies feed on processes rather than brains. They think project management and organizational processes are like a cook book and they need to be followed. The Zombies drag others down with their one way ideas. So, what is Zombie PM? Does this sound like someone you know? If this sounds like someone you have worked with – you know what Zombie PM is about. Currently I have 3 projects I'm managing. One is the in initiation stage. One in controlling. And one in the closing. For each of these projects I have different concerns with my resources. For the project that I'm initiating I'm working with the resource managers to make sure I'm on their plan to have the resources I need based on my project requirements. I keep them in the loop if things slip a little or if it looks like we may be adding scope. For my project that is in the the controlling phase I have to box out my resources as others try to "get a little of their time". There is a fine line with this, because many times you need to trust your resources to manage their own time so they can help out on other projects too. In my project that I'm closing out I've kept the resource manages in the loop as to when I was going to release the resources so they could be assigned elsewhere. This is a delicate yet complicated dance that we do as Project managers. The key to this is communication with the project team and the resource managers. Recently I attended the Madison PMI Professional Development Day at the Monona Terrace. 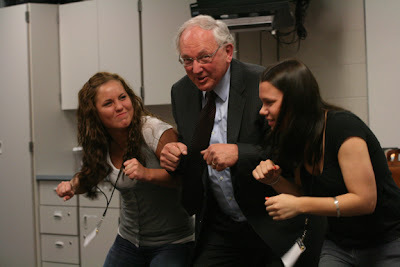 The theme was Great Leaders Building Strong Teams. The first keynote speaker was Barry Alvarez, Athletic Director at the University of Wisconsin. Barry told many stories from his career as the Head Football coach starting with the challenge of changing the culture of a losing team to moving the mind set of his team to see it was not just Ron Dayne going for the Heisman Trophy but the whole team. Finally he mentioned how he kept his team focused on achieving the WIN (What’s Important Now). Lesson Learned: If you are tossed into a loser ongoing project gather the troops and focus on what done is. Terry is the author of Taming Change with Portfolio Management (checkout my book review) and he started out his talk with some stats from a survey he has conducted a couple of times over the past couple of years. The biggest eye opener in the survey was that organizational alignment was the biggest issue. Lesson Learned: If you don’t focus on alignment your organization and projects will continue to flop around. Mark went over two examples of PMOs that he created. He came from a very structured PMO with State Farm and then he moved on to take on a job with the state of Illinos to help one of their departments create a PMO. Mark came in with a tool box full of templates, policies and how to’s, but quickly found out it wasn’t going to work. He stepped back and slowly rolled things out like an agenda template and status reports. Also he found out the super formal way that worked for all projects at State Farm wasn’t going to work, so they came up with a PM Light version of their PM process and trained all project members on project management. 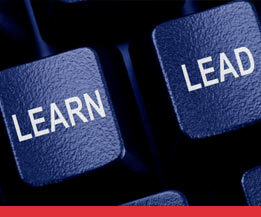 Lesson Learned: Adapt project management to the organization, then adapt the organization to project management. Ted went over the basics of using Microsoft Project. From setting up a calendar to making sure you build your timeline like a network diagram (you need a start task and an end task). Lesson Learned: If you stick with the basics your timeline work correctly. Then I attended a talk titled: Influence and Persuasion skills for Project Leaders by Chris Hinrichs. Chris reviewed his views of project leaders which included those who know how to inspire, influence and impact others in a constructive and supportive way often go the furthest and the highest. Lesson Learned: Practice the fundamentals of leadership and you will be in a better position to excel. Finally the second Keynote speaker Mark Johnson spoke. Mark was on the 1980 US hockey team is the current UW Women’s hockey coach. Mark Reviewed his career in Hockey and told some stories on how he motivates his team. Lessons Learned: Even if you are a coach, sometimes you need to be a cheerleader. It has been awhile since I reviewed a project planner so I thought I would take Planning Force for a spin. On their main page there is an 8 minute video that gives a nice overview of the product and there are several other short videos on their YouTube page (I’m not sure why they want you to register to view their youtube videos on their own webpage or why many of their videos have no sound just a person clicking around in their application, or why you have to register to review their forums). Their express planner is a free download (100 meg file). Many other applications like these are cloud based. The main issue I have with stand alone products are updating them. After I had it installed I started clicking around and checking it out. Overall it is a very very basic project planner with resource allocation capability. The planner is pretty straight forward to use and the resource planner is too. It also will allow you to see the resources from multiple projects saved in one file (they must assume companies only have 1 PM running all of their projects?). It has a resource leveling function that will give you options before you move forward with their suggestions. No clue as to how it works, but most projects I have ever worked on the resources don’t have the knowledge to jump in if they have some free time. It does have a calendar feature so you can track your staffs vacation (or holiday) time. At the task level you can do some very basic things, number of days (or 0.5 for 4 hrs), start and end dates, predecessors (lead, lag if needed), percent completed, add notes to the task and the resource name. What it is missing from this section … costs for the task planned and actual (not all projects track this… but if you are looking to do a little earn value analysis…) and how about I can create a column and let me name it myself? Probably not that useful for projects with staff that work outside of your office (all projects have some basic documentation (SOW, charter, WBS, requirements, Risk log, budget info …) and this application doesn’t allow you to store that type information. No communication tracker … message board, or a newsfeed type of feature (@task has this and you will see more and more PM software adopting this soon). Do you have a list of all of your projects (you would be surprised how many said no …)? Do you rank your projects, and if so how are you ranking them? Do you really have enough resources for all of your projects? If not, why are you trying to do them all at the same time? Do you review your projects, let’s say, quarterly to make sure you are focused on the right ones and to cut the ones where the market place has changed? Do you have this list in a common location for all to see (again, you would be surprised how many said no to this … really?)? The key to making this ranking system work is having the correct ranking criteria for your organization prior to sitting down with the ‘deciders’. The ranking criteria will include things like project performance indicators, business value indicators, looking at the resources needed and finally things that are deemed important by your organization. Here is a short presentation that I put together using some of the concepts from a presentation by Barbara Schrage. The key to making this work is having something in place to rank your projects and a reason why they are ranked the way they are. Otherwise the top projects in your company will be someone’s pet project which may not help the strategic vision of your organization (I like to call these the chest thumper projects or the, whoever is the loudest has the highest ranking project). 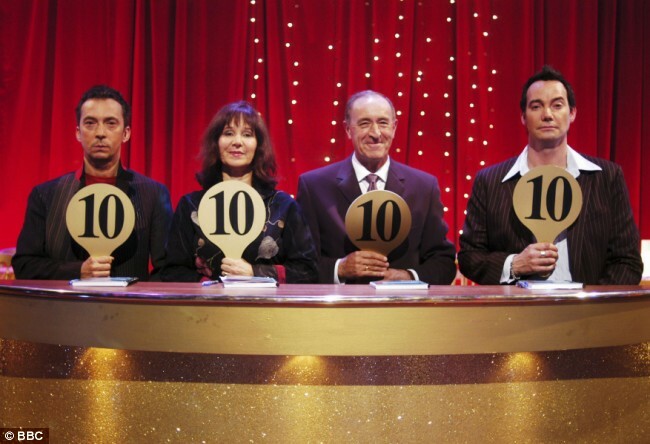 How to do you measure the maturity of a SharePoint implementation? So your organization is thinking about taking the leap, or already has, into launching SharePoint. When you started on this adventure you treated this as a project, right? Or did you just turn it on and send out an email stating, “SharePoint is now available”. If you don’t treat it as a project you are headed for an early disaster and users won’t want to use it. The key to adoption of SharePoint is to start out small with one department and bring in those team members that are typically the early adopters. As you build up the first site you will also need to build your training documents and start to train the people that will use the site. Then you need to continue training, re-training, start to add articles to your company’s newsletter or blog about SharePoint and finally if it is a requirement to move away from the old paper way, monitor your staff to make sure they made the switch. Once you get to the point that your company is making the switch over to SharePoint we need some metrics to determine how SharePoint is maturing within your organization. About a year ago some of the big name advocates of SharePoint started this discussion. And recently Sadie Van Buren has been giving talks about how she determines the maturity of a SharePoint system in an organization. Below is her template to determine the maturity of a SharePoint system. And here is her presentation that shows some examples of 100 and 500 level SharePoint sites, and she also gives an overview of each area and what she thinks is a 100-500 level of maturity. SPBizChat Ep2: Understanding SharePoint Maturity Model from Dux Raymond Sy on Vimeo. In my own organization I’ve seen our SharePoint sites go from only a couple hundred clicks a month to now over 130,000 clicks per month. That is a pretty impressive jump and we are only at about the 300 level of maturity.